Going to the pages for at least some of them say that the job is expired. A location-specific feed had a similar problem about the same time, but a feed that was just "contract jobs allowing remote" did not appear to have this issue. I don't know how easily this issue can be reproduced, but perhaps there is an internal log to check? Also, it is unclear whether the present issue is related to Why do these old post continue to arrive by "newest" RSS feed?, a possibly-similar issue relating to the main site. 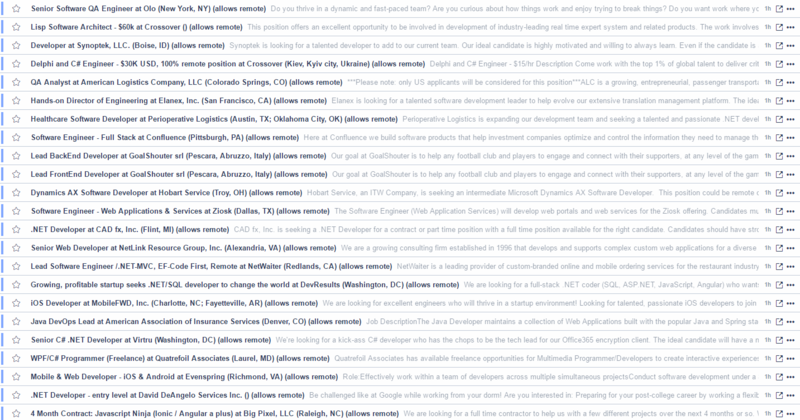 This was caused by a known bug where we temporarily (for a few minutes) showed expired jobs our search results. It was a one-time bleep, and should hopefully not reoccur. Not the answer you're looking for? Browse other questions tagged bug status-completed jobs rss . Why do these old posts continue to arrive by “newest” RSS feed?